It takes a village to raise a child—and the continued support of that village to help the child succeed academically. When strong partnerships are formed between schools, students’ families, community members, and local organizations, school practices and operations improve—as well as student performance. 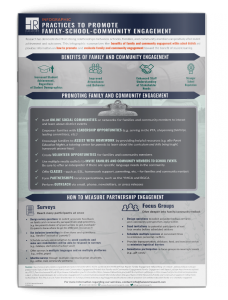 Our new infographic, Practices to Promote Family-School-Community Engagement, guides districts on engaging family and community members to actively support students’ development and learning.